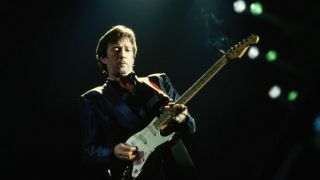 Clapton's playing - like many great blues guitarists - incorporates the sounds of the heroes he grew up listening to, such as the 'three Kings' (Freddie, BB and Albert), Buddy Guy and Robert Johnson. His fieriest playing came during the late-60s Cream/Gibson era, when he delivered blues progressions and rock lead with his ferocious 'woman' tone. Eric's solo career kicked off in the 70s with a switch to Fender Stratocasters and a more relaxed Southern rock style on tracks such as After Midnight and Motherless Children. By the mid 80s, Eric's now tight but lyrical phrasing and famous creamy sound - as heard on Forever Man - had become the norm. The secret to the opening phrase is to pick the first-string 1oth fret note, rather than use a hammer-on. The 11th fret A# is a staple Clapton major 7th idea. The staccato notes, triplet lick and quarter-tone bends are classic early-period Clapton. Try these phrases during a 12-bar blues jam for an authentic vibe. This fiery lick comes complete with bluesy minor-to-major-3rd hammer-ons. The final note lands a change to the V chord, typical of a I-IV-V progression. The country-style chromatic line at the end of this lick is typical of Eric's late 70s style. Practise the shifts and diad bends before piercing the lick together. As Eric's blues vocabulary developed in the 80s and 90s, he would play combinations of ideas, such as the triplet legato phrase (bar 1) and the wide Albert King-style three-semitone bends (bar 3). The latter idea works really well dragged across the beat in quarter-note triplets and released slowly. Although not an early influence, Jimi Hendrix's style can be heard in some of Eric's chordal improvising (especially since the 90s), seen here as diad slides and hammered-on chord embellishments. Using fingerstyle will help you get the separation between bass notes and upper strings, also giving you a softer sound.